Mine: Nicely done. The villians as is often the case are a ton of fun. Anne Reinking does some terrific dancing. Leonard Maltin/Plot synopsis: Overblown adaptation of the Broadway musical hit about the Depression's most famous foundling (based on Harold Gray's ``Little Orphan Annie'' comic strip). Appealing performances by Quinn, as Annie, and Finney, as Daddy Warbucks, help buoy an uninspired--and curiously claustrophobic--production. 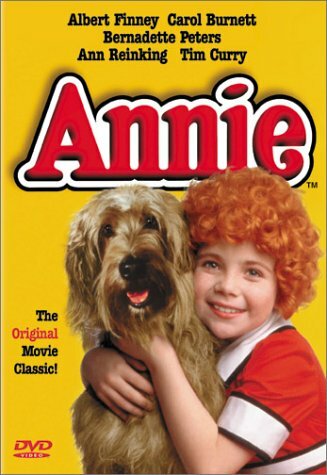 Followed by made-for-TV sequel, ANNIE: A ROYAL ADVENTURE! Panavision. (out of 5 stars) Cute but not the best as far as musicals go. I have to say that it's better than the recent re-make. Curry, especially, is really appealingly evil.